Last week I joined a group of moms and their little ones for a morning of social gathering and playing. I didn’t know any of the moms and it happens that most were first-time moms with babies under the age of one. For a couple of hours I got to hear stories I once told others regarding my little babies, who now are little men. The feeding on demand, the short and sleepless nights, the first rollover, the first solid food, the first crawl… Some of my babies’ past is becoming blurry. Sometimes I confuse which baby did what. But I also remember some moments in great detail, including the little suckling noises they made as I nursed them in the stillness of the night, their super cute smiles and giggles, their unique ways to crawl, their reactions to first foods, their first steps… It seems it all happened so long ago and yet, it’s just been a few years. Time really flies when you’re having fun. And even when it’s not all fun sometimes. 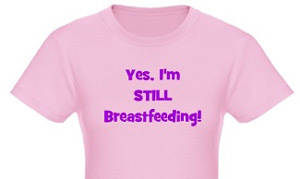 One of the inevitable new-mom subjects is breastfeeding. Here in California, where people are more obsessed concerned with their health, it seems most moms give it a try. California laws support breastfeeding, allowing it in all public places and requiring employers to provide a private place to pump (restroom stalls not included). Many moms I’ve talked to (working and not-working) have managed to nurse their babies for a year or more, just as I did. So I was surprised to hear the mom of a seven-month-old baby tell another mom she had breastfed her baby since birth, but she stopped at six months, even though she was still producing milk. The most interesting thing is when the other mom asked her why she’d stopped, she didn’t have an answer. She said she just stopped. This left me perplexed. 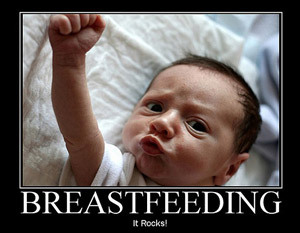 Everyone who’s ever tried to breastfeed will tell you the first few months are the hardest. Baby and mom need to become acquainted and often taught how to nurse. Mom is exhausted, nursing on demand, and doesn’t get much of a break. After a few months though, the feedings space out and baby becomes a suckling pro. If a mom nurses for the first six months, she’s gone through the hardest part of it all. So why would a mom who embraces breastfeeding for the first six months of her baby’s life suddenly decide to stop? This mom stays at home and doesn’t experience any pressures from outside work, has no older siblings taking her attention and breasts away from the baby, and still produces plenty of milk. Why make the switch to expensive and non-natural formula, deal with making bottles, and not want to maintain this special bond for a few more months? I just don’t get it. If all is going well, why stop it? I can’t think of any good reason why. And clearly, this mom couldn’t either but still did it. Would someone please enlighten me? Some of you may have heard through the rumor mill that Medela issued a voluntary recall on a selected amount of its Pump in Style breastpumps. There is no official recall through the US Consumer Safety Product Commission as the recalled pumps don’t cause any harm to individuals. All it looks like is a bunch of possibly defective breastpumps, and a great company accepting the defects and offering replacements. Medela is offering to replace defective pumps at no cost. Breastpumps were manufactured between February 10, 2010 and March 3, 2010, so I’m guessing very few moms are affected by this problem. 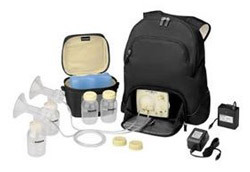 For complete details about the Medela breastpump recall, including the serial numbers of the breastpumps being recalled, just visit the Medela website recall page. I personally used a Medela Pump in Style breastpump to pump milk for both of my boys several times a day as I was working full time, and I never experienced any problems with the pump. It’s very durable and I would recommend it to any mom who needs a serious breastpump.